Night vision goggles detect heat in the form of infrared radiation—a “color” normally invisible to the human eye. Wearing a pair you can see sleeping dogs, or anything that’s warm, in complete darkness. This same trick works in the darkness of space. Much of the exciting action in the cosmos is too dark for ordinary telescopes to see. For example, stars are born in the heart of dark interstellar clouds. While the stars themselves are bright, their birth-clouds are dense, practically impenetrable. The workings of star birth are thus hidden. There is one problem, though, for astronomers. “Infrared telescopes on the ground can't see very well,” explains Michelle Thaller, an astronomer at the California Institute of Technology. “Earth's atmosphere blocks most infrared light from above. 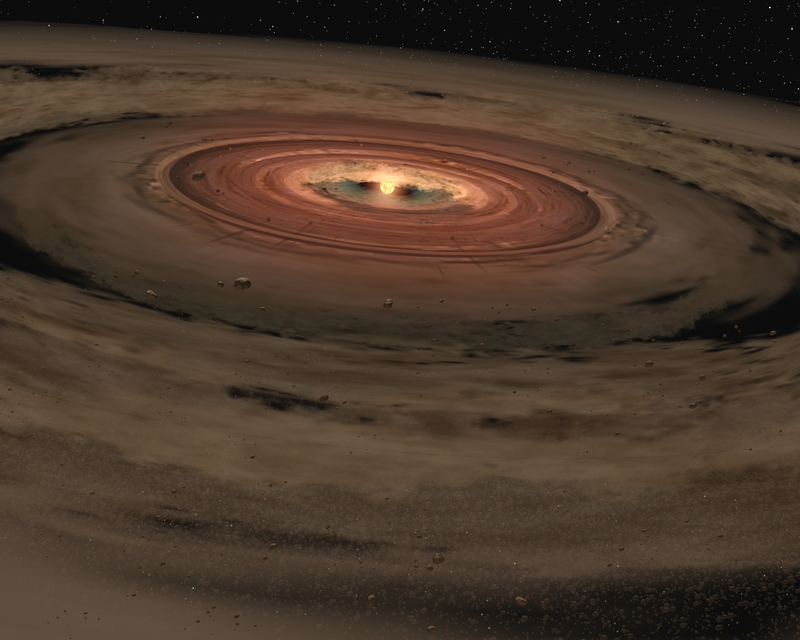 It was important to put Spitzer into space where it can get a clear view of the cosmos.”The clear view provided by Spitzer recently allowed scientists to make a remarkable discovery: They found planets coalescing out of a disk of gas and dust that was circling—not a star— but a “failed star” not much bigger than a planet! Planets orbiting a giant planet?The celestial body at the center of this planetary system, called OTS 44, is only about 15 times the mass of Jupiter. Technically, it’s considered a “brown dwarf,” a kind of star that doesn’t have enough mass to trigger nuclear fusion and shine. Scientists had seen planetary systems forming around brown dwarfs before, but never around one so small and planet-like.Spitzer promises to continue making extraordinary discoveries like this one. Think of it as being like a Hubble Space Telescope for looking at invisible, infrared light. Like Hubble, Spitzer offers a view of the cosmos that’s leaps and bounds beyond anything that came before. Spitzer was designed to operate for at least two and a half years, but probably will last for five years or more. Artist’s rendering of brown dwarf OTS44 with its rotating planetary disk.